Second Peter is something of a textbook case for Pseudepigraphy. Outside of conservative circles, few accept this historical Peter as the author of the book. As J. N. D. Kelly said in 1969, “scarcely anyone nowadays doubts that 2 Peter is pseudonymous.” Despite several excellent commentaries in recent years (Neyrey, Bauckham), there has been little change in this consensus. 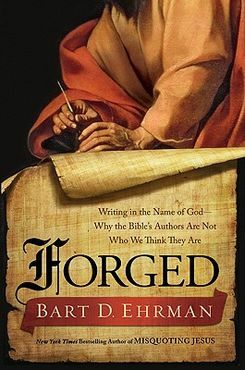 Bart Erhman dealt with this issue in his popular level book Forged, drawing attention in the media to the possibility that the traditional authors of many of the books in the New Testament are not likely the real authors. In fact, questions about 2 Peter appear very early in church history, Eusebius said that “Peter has left behind one acknowledged epistle, and perhaps a second; for it is questioned” (Hist. Eccl. 6.25.11). Despite this reservation, Eusebius reports that the church did in fact accept 2 Peter as an authentic letter and therefore included it in the canon. Michael Kruger makes an excellent point in his 1999 article on the authenticity of 2 Peter. He points out that in the second and third centuries a great deal of pseudegraphic literature appear which centered on Peter. Both the Gospel of Peter and the Apocalypse of Peter appeared and were rejected by the church because the were not authentic. If there was a possibility that Peter was not authentic, it should have been treated the same as these other spurious documents. Is the case against an authentic 2 Peter as strong as Kelly (and others) state it? It is true that the second letter of Peter is quite a bit different than the first, although these differences can be accounted for in ways other than different authorship. Remember, “authorship” in the Greco-Roman world did not have to mean that the author literally wrote – an different amanuensis might account for the differences, especially if that person was given a more free had in one letter than the other. And as Kruger points out, there enough similarities to make the case that the two letters are related. Frankly, statistical analysis on two short samples is a serious problem for either side in this argument. There are several personal references in the letter that seem to come from a “historical Peter.” In 1:17-18 there is an allusion to the transfiguration, an event that Peter witnessed. Again, Kruger does an excellent job pointing out the verbal similarities between this verse and Matthew 17:5 and Luke 9:31. And again, this evidence cuts both ways. Peter might have referred to the transfiguration in his writing (I certainly would have!) But if I were creating a letter which “sounds like” Peter, I would include this sort of thing to give the letter the “ring” of truth. (In fact, it is odd that the words are the same as the gospels which Peter is not associated with, Mark.) The same observation is true for Peter’s reference to the letters of Paul. This one sounds a bit too suspicious, as if someone was creating more unity between Peter and Paul than we might have guessed. Still, it is evidence for either side of the discussion. Theology, on the other hand, is a more serious problem for the traditional view. As Käsemann, observed, the Cross is not a particularly prominent theme in the letter, although 1 Peter mentions the crucifixion and resurrection several times. This is a serious charge, but I think Kruger is correct to point out that the purpose of the letter is not soteriology, but dealing with a threat from false teachers. The problem with these particular teachers is not the Cross, but ethical and moral concerns. Would a pseudepigrapic 2 Peter make it less authoritative? Suppose that someone did in fact create a letter in Peter’s name at the end of the first century which reflected Peter’s response to declining morals in the church. Perhaps a writer was simply using Peter as a literary device to deal with important issues in the late first century. Does this make it less worthy of the canon? J. D. Charles (Faithful to the End, 129f) would say that it does indeed matter. If we now know for sure that Peter is not really the author of the letter, then it has no more claim to authority than 1 Clement, which would have been written about the same time for approximately the same reasons. What is more, we are confident that there was a historical Clement who write the letter, so it is at least authentic. Why not treat the teachings of Clement as authoritative? Michael J. Kruger, “The Authenticity Of 2 Peter,” JETS 42 (1999): 645-71. Ernst Käsemann, Essays on New Testament Themes (London: SCM, 1971) 183-184. Origen records the controversy (as Eusebius states, HE 6, 2, 58), but places the Epistle in his canon of Holy Scripture, and quotes from it some six different times, and sometimes naming St. Peter as the author. Bishop Firmilian, a contemporary of Origen, mentions in a letter to Cyprian, that St. Peter wrote as espistle against the heretics, which can only refer to 2 Peter. Also Athanasius quotes it twice. Clement of Alexandria, according to Euesbius, HE 6, 14, I, wrote a commentary on all seven Catholic Epistles, but this work has not come down to us. I would like to talk about whether or not a pseudepigraphic 2 Peter would make the book less authoritative. I think that in most people’s eyes it would cause most to question the book and probably dismiss it from any use for Bible studies or sermons. The post above states that Origen believed there was some controversy. Jobes also says, “It is true that the early church fathers record the doubts of others or their own about the authenticity of 2 Peter” (388). But I wonder does it even matter? In all honesty, there is a ton of evidence suggesting that it could have easily been a pseudepigraphal letter. I don’t really care who it was written by. I don’t think that 2 Peter introduces that much theology and has a lot of practical things that could be applied to make us all stronger Christians. In my opinion, some of the more theological stuff such as the Day of the Lord that 2 Peter does talk about, is consistent with what other New Testament writers have written. For example 2 Peter 3:10 says, “But the day of the Lord will come like a thief…” Paul writes in 1Thessalonians 5:2 the same exact thing! I don’t know anything that sticks out as untrue or crazy from 2 Peter. Everything seems to match up so I don’t see what the problem is; even if Peter didn’t write it. We simply must over-come these statements and reality! And this in reality is the whole issue! And you yourself argue on internal evidence. If we move to allow pseudonymity, then we have a huge game changer, in my opinion. As Philip is asking with 1 Clement, etc. We can note that Roman Catholicism uses this idea easily, and makes the Church itself the basic authority, and thus well past the Apostolic age. But this was not the way the early church itself measured the Apostolic! As we can see here more with the Eastern Church Fathers. But, this is mostly an issue with the Church Epistles or Letters, than the Gospels. Though the Gospel of John certainly does appear to be from the Apostle John himself, (John 21: 23-24). I am very intrigued by this whole “pseudonymous” idea. This historical and literal concept was not even introduced to me (as far as application against biblical books) until recently, so the fact that people question whether or not 2 Peter was even written by the apostle Peter, simply blows my Christian worldview away. I believe that Greg makes a great point on the Theological side of 2 Peter and it matching the content and statements of other New Testament books; however Jobes made a comment that sparked my curiosity. “Even the most conservative doctrine of Scripture does not allow us to prejudge whom the Holy Spirit may or may not have inspired to write, so the evidence for pseudonymous authorship needs to be seriously considered (Jobes, Locations 8877-8878).” We can certainly always quote from scripture that “all scripture is God breathed” (2Ti 3:16), but does this issue of 2 Peter being pseudonymous raise further questions? Jobes states that the early church accepted this book as authoritative and so I believe that should also bring some closure to the issue. If anyone would have found “red flags” in the letters it would have been by people living in the context of the authorship date. This may just be one problem that will never be fully understood in our lifetime! Usually we can find non-canonical books mixed in on Biblegateway, but I could not find 1 Clement in the list of Books. So if it didn’t get into that list there must not be much respect for this book. I found it interesting that there was both a Gospel of Peter and the Apocalypse of Peter that were analyzed to see if they were canonical books. After taking a church history class it was encouraging to know just how these books were sifted through. 2 Peter being pseudepigrapical does not change the importance or need for the letter. The letter being written as one of Peter’s helped it to flourish in a roman society when it needed to be. God has a crazy way of making all things work together. Just as God made all of the scriptures pseudepigraphical or not God Breathed. This scripture is useful for teaching and rebuking. That is why it is still relevant to Christians now. God is timeless and the way He makes things work are unknown to us, but we can learn and grow from them at the end of the day. So whether it was Peter or Clement does not matter. What does matter is that we accept this letter as God’s truth to His people, and grow from what we read. At least grow from the parts that apply to us. Pseudepigraphal or not the book of 2 Peter is God’s word and is inspired. Karen Jobes, in the textbook, “Letters to the Church,” explains that there was a reason for pseudipgraphy. She says, “…writing in the name of an apostle who was known to be deceased provided continuity between contemporary church leadership and apostolic orthodoxy” (Jobes, 2011, pg. 361). Church leaders would write in an adopted name of an apostle that they shared the same beliefs with. “Pseudonymity is motivated by the assumption of Spirit-inspired interpretation given to an authorized group of teachers to indicate continuity between an apostolic source and its later interpreters” (Jobes, 2011, pg. 361). For this purpose, Clement may not have been the inspired word of God.